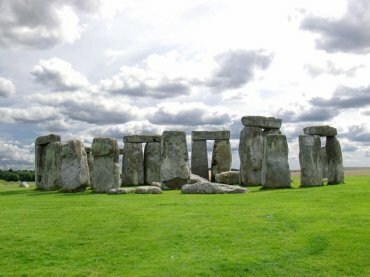 Stonehenge is to be found on Salisbury Plain about 3 miles west of Amesbury near the junction of the A344 and the A303 roads with the entrance on the A344. 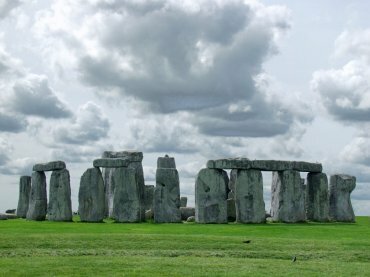 The construction of Stonehenge was started about 4800 years ago (2800 BC) with a circular ditch and bank, the 'henge', followed by a central wooden structure about 600 years later. One hundred years after that the stone monument was built which then went through a number of changes over the next 1000 years. No sense in rushing these things! The larger stones forming the main outer circle are Sarsen stones brought from the Marlborough Downs about 20 miles away but the smaller inner circle is constructed of Bluestones which were brought from the Preseli Hills in south-west Wales. Each of the standing stones are about 13 feet high, around 6 feet 10 inches wide and weigh approximately 25 tons. The lintels are about 10 feet long, 3 feet 3 inchest wide, 2 feet 8 inches thick and are about 16 feet above the ground. The total diameter of the outer circle is 110 feet. 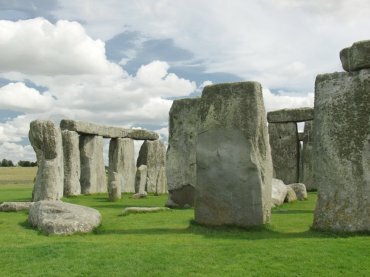 Originally visitors were not excluded from walking in among, or touching, the stones but this caused serious erosion and the monument was roped off such that visitors could only walk around Stonehenge at a short distance. 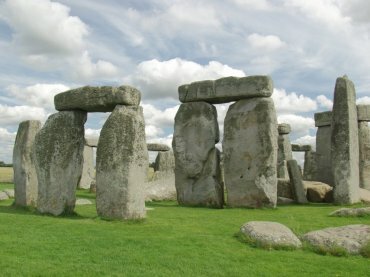 Stonehenge is in the care of English Heritage but the surrounding grassland is owned and managed by the National Trust.